Escalade® Sports warrants to the original Consumer Purchaser that any Product of its manufacture is free from defects in material and workmanship. THIS WARRANTY IS VOID IF THE PRODUCT HAS BEEN DAMAGED BY ACCIDENT, UNREASONABLE USE, NEGLIGENCE, IMPROPER SERVICE, FAILURE TO FOLLOW INSTRUCTIONS PROVIDED WITH THE PRODUCT OR OTHER CAUSES NOT ARISING OUT OF DEFECTS IN MATERIAL OR WORKMANSHIP. Subject to proper installation and normal Residential use, Escalade ® Sports warrants, subject to the limitations below, to the original retail purchaser all structural components (not accessories) of the Goaliath® System to be free of defects in material and workmanship for a period of One (1) year from the original purchase. 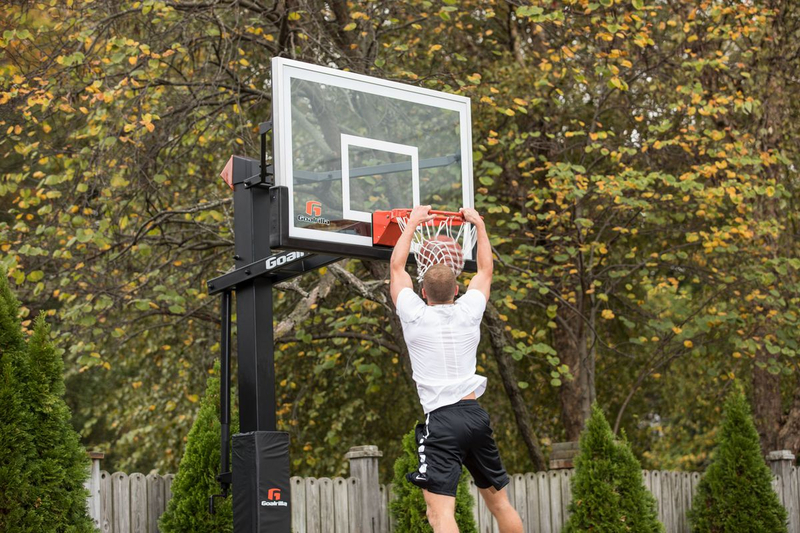 Merchandise must be shipped prepaid with a copy of proof of purchase to Escalade® Sports factory for examination to determine if the basketball system needs to be repaired or replaced. Any labor costs, travel expenses and any other changes involved in the removal, installation or replacement of the defective/repaired parts from/to your Goaliath®System will be the purchaser's responsibility. Shipping charges for replaced or warranted merchandise sent back to the customer from Escalade® Sports factory must be prepaid by the customer in advance. If not, the replacement shipment will be sent out collect. Escalade® Sports reserves the right to examine photographs or physical evidence of merchandise claimed to be defective, and to recover said merchandise, prior to authorization of warranty claims. A “Returned Goods Authorization” number may be required, please call for details prior to the return of any photographs or merchandise. This limited 1 year warranty is expressly in lieu of all warranties, expressed or implied, including warranties of merchantability or fitness for use. Escalade® Sports does not assume or authorize any person or representative to assume for us, any other liability in connection with the sale of our products. The remedy of repair or replacement stated above is Escalade® Sports exclusive remedy. Escalade® Sports will not be liable for any other damages or expenses which may incur, including but not limited to incidental or consequential damages. Escalade® Sports assumes no other obligations or liability on the part of the purchaser, and Escalade® Sports neither assumes nor authorizes any other person to assume for it any other liability in connection with the goods sold. Which unit did you purchase?